Human Resource Development Institute announces ENROLLMENT and REGISTRATION FOR EIM NCII. Open for April 22, 2019 class, the schedule is Monday to Friday, 8:00 am to 5:00 pm. 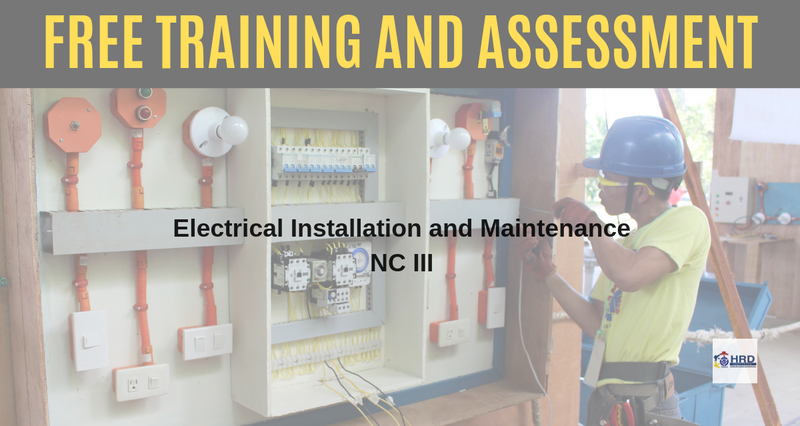 AVAIL FREE TRAINING AND FREE ASSESSMENT NOW! (1)*Academic records such as National Certificate issued by TESDA, Transcript of Records(TOR) College or High School Class Card supported by Certificate of Employment. (3)*Proof of Good Moral Character such as NBI or Police Clearance or Certificate of Good Moral Character issued by Barangay. "NO, or LACKING" documents will not be entertained. NO RESERVATION. Items with *: Only the photocopy shall be collected, however, the original copy needs to be presented upon enrollment. For inquiries please visit Human Resource Development Institute at Bayani Rd., Fort Bonifacio Taguig City, or you may contact them to their facebook page TesdaHRDI.